The former bosses of collapsed US energy giant Enron have expressed shock and disappointment at being found guilty on fraud and conspiracy charges. "Certainly we're surprised,... we're shocked, this was not the outcome we expected," Kenneth Lay told reporters after the verdict. "I'm disappointed," said Jeffrey Skilling. Lawyers promised to appeal. Before it went bankrupt in 2001, the energy trading firm was the seventh largest company in the US. Its collapse had a very real human cost as thousands lost their jobs, their savings and their pensions, says the BBC's Jane Little at the courthouse in Texas. Former Enron worker Deborah Defforge said she was "glad it's over, it's put closure to it". "I feel sorry for the families, but at the same time the reality was that we suffered the most when we were let go." A spokesman for President George W Bush said the verdict should be seen as a warning to other corporate criminals. "The administration has been pretty clear there is no tolerance for corporate corruption," said White House spokesman Tony Snow. On the sixth day of deliberations, the jury decided the two men lied to employees and investors to cover up billions of dollars of losses at Enron while enriching themselves by selling their stock. Skilling was found guilty on 19 of the 28 counts he faced - with the "not guilty" verdicts coming on some of the charges of insider trading. He could receive as much as 185 years in jail. Lay was found guilty of all six fraud and conspiracy charges that he faced. He could get as much as 45 years behind bars. Both men have posted $5m bonds to avoid custody until sentencing in September. "We fought the good fight," Skilling told reporters outside the court after the verdict. "Some things work, some things don't. Obviously I am disappointed but that's the way the system works." Lay said: "Certainly we are surprised, more appropriate to say we are shocked, certainly this is not the outcome that we expected. "I firmly believe I'm innocent of the charges against me, as I have said from day one, I still firmly believe that as at this day," he said. The trial of Lay and Skilling in Houston follows four years of investigation by the department of justice's Enron Task Force. It lasted for 15 weeks, with 54 witness called by the two sides. The saga began in October 2001, when the company announced huge losses as its shares dived. Two months later, it filed for bankruptcy as allegations began to emerge that it had used off-the-books offshore firms to hide losses. 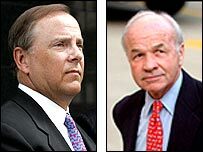 The firm's auditor, Arthur Andersen, was forced out of business following the collapse of Enron, as it was seen as having colluded in the accounting practices. The Enron case is the culmination of a string of high-profile cases involving corporate misbehaviour. Among them was the conviction of Worldcom chief executive Bernie Ebbers for fraud and conspiracy, and homecare queen Martha Stewart for lying to federal investigators. Numerous other Enron executives have been convicted - many after pleading guilty - in court cases across the US. They include Andrew Fastow, Enron's former chief finance officer who agreed to testify against his former bosses.